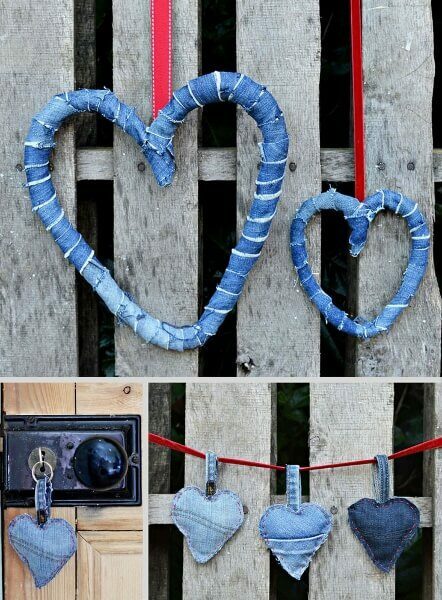 One is a really cute heart shaped wreath made with long strips of denim and an old coat hanger. These rustic hearts look so good that never mind Valentine’s day, I think I will keep them up all year round. For the other denim heart decorations I used a cookie cutter as a template to make some cute padded hearts, These look great hung up in a garland but also make a really sweet key ring/chain. Which ones do you prefer? As I said I couldn’t decide so made both. If you like this project, you might be interested in our Denim Upcycle DIY’S <====== click this link!